Driving a modified vehicle can provide challenges to any driver, regardless of one's abilities. Northeast Rehab offers a comprehensive Driving Program for people who have had an illness, injury, or age related decline in skills that could affect their ability to drive safely. For your convienience, We've assembled a list of outside resources that may prove useful for your individual situation, as well as a collection of brochures that you can download for later veiwing. To say Thank You and to give back to the community, Affordable Mobility offers agencies free storage for used equipment, at any of our three NH storage facilities in Auburn, Andover, and Danbury, NH. Please contact us for more details. Note that Equipment owners are responsible for their own insurance which should include fire and theft. While our focus is primarily on installing accessibility equipment, we are open to new ideas that have the potential to benefit people of all abilities. To that end, please enjoy some of our current and previous endeavors. This tiny house on wheels was built as a mobile showroom for fairs and small town events. Tiny houses would be idea projects for a schools to provide housing for homeless veterans. There are no schools to teach how to install accessiblity equipment to best fit an individuals unique needs. There are also returning Veterans who have the skills and expereinces that would be ideal for this type of work. Introducing my good friend and customer Earl Durand, a retired pet distributor that loves horses. This accessible horse carriage is his design, called appropriately "The Accessible Horse Buggy". 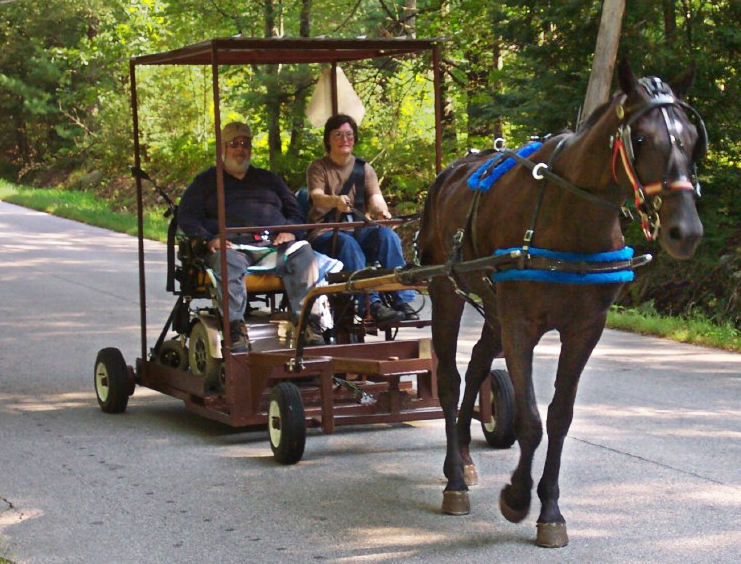 If you would like more information on having your own Accessible Horse Buggy made please contact Linda at (603) 483-8468.